Too many suds in the washer is only funny on a sitcom. It is not good for the machine or your laundry. This is a guide about reducing suds in the washer. I am sick of the amount of suds the new concentrated detergents produce. I have cut the liquid down to nearly nothing and still have a mound of suds in the rinse cycle and feel the need to run that cycle again. Any suggestions? Do you have soft water where you live? This produces more suds. I don't have this problem as I live in a hard water area. You might try using a powdered detergent. I think they create less suds. When we bought our washer and dryer we were instructed to use very little detergent. I start the washer, add 1 scoop of generic brand oxygen cleaner. Then I add the dirty clothes and and while they are agitating, I slowly pour in a small amount of liquid detergent and you can tell if you have enough suds. I use Ivory dishwashing soap or Dove dishwashing soap or Dawn dishwashing soap, about four small squirts, because I don't like detergent. I used to do handwashing in it and just moved that habit over to the washing machine....LOL! It works, is better for my hands, and the clothes smell fresh. Dawn is good for really nasty clothes. I like dawn but I rarely use it in the wash. Sometimes I will put 1/6 of a cap of fabric softener in the wash water with the soap and it comes out like perfumed clothes. I don't like fabric softener staying on my clothes either. Put in some fabric softener in the machine. Just a wee bit on the suds. They go away. Run the machine with just water after to remove the softener. It is not good to use. Buy the washing liquid that is for front-loading machines. They are low-suds. I use it in my twin-tub machine, and it's great. Regards, Leah from Down Under. Add a 1/2 cup of white vinegar to the rinse cycle water. This should do the trick. I also read (cant remember what magazine) that you can double your liquid detergents usage by only using 1/2 the recommended amount per load. Are you using one of the ultra laundry soaps? You may be using more than you need to use. Read your label. If too many suds for whatever reason, try using a bit less soap. You need full amount given if it is a load of muddy jeans for example. But if something lighter or thinner, use less. I am supposed to use a capful of brand I use, I use half a cap. Still gets clean. Try it, can't hurt. 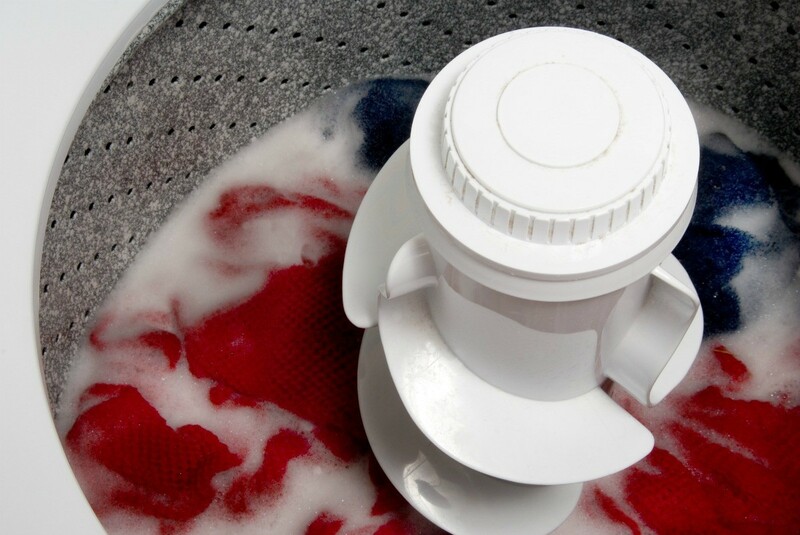 Besides vinegar and fabric softener what else can I use to reduce suds in the washing machine?